"Each diploma is a lighted match. Each one of you is a fuse." Find Inspirational quotations that urge you to be your best YOU! "Your schooling may be over, but remember that your education still continues." "The tassel's worth the hassle!" "You cannot help but learn more as you take the world into your hands. Take it up reverently, for it is an old piece of clay, with millions of thumbprints on it." "Graduation is only a concept. In real life every day you graduate. Graduation is a process that goes on until the last day of your life. If you can grasp that, you'll make a difference." "I hope your dreams take you to the corners of your smiles, to the highest of your hopes, to the windows of your opportunities, and to the most special places your heart has ever known." "Put your future in good hands - your own." Yes, there are more graduation inspirational quotes can you believe for you to read. But first how about checking out some inspirational graduation quotes a la YouTube - you might find them easier to digest! "The one real object of education is to have a man in the condition of continually asking questions." "Wise are those who learn that the bottom line doesn't always have to be their top priority." "Your families are extremely proud of you. You can't imagine the sense of relief they are experiencing. This would be a most opportune time to ask for money." "There is a good reason they call these ceremonies 'commencement exercises.' Graduation is not the end; it's the beginning." "Whatever you do, you should do it with feeling." (Ahem! Subscribe to The Weekly Wonder newsletter - it's inspirational! "Keep in mind that neither success nor failure is ever final." "Education is an admirable thing, but it is well to remember from time to time that nothing worth knowing can be taught." "If you think education is expensive, try ignorance!" "A graduation ceremony is an event where the commencement speaker tells thousands of students dressed in identical caps and gowns that 'individuality' is the key to success." "Life is my college. May I graduate well, and earn some honors!" For the rest of life awaits! BUY my quotes book. All these short inspirational quotes can be found in my very own daily inspirational quotes book that I call, "Wonderful and Marvelous - Daily Empowering Quotes (About You!)" 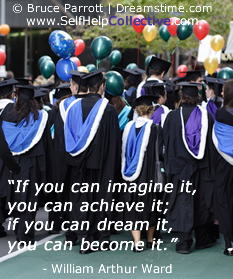 Share this graduation inspirational quotes page - thanks!